The most modern and cost-efficient Storage and Retrieval system for today’s industry. Use of the complete available height for storage. Works on a simple Paternoster principle. Works on a two vertical chain loop mechanism, which is electrically driven. A sheet metal cladding ensures protection this assembly. A window is provided at ergonomic level for easy loading and unloading of material. Entire control using a PC based software with versions for inventory and document management, a PLC controller and an emergency manual mode. The system is available from 2 m to 20 m.
Specially designed trays to suit shape, dimensions and weight of the material to be stored. Low noise due to well-engineered guiding mechanism using high quality bearings. Fast retrieval due to higher speed and shortest path logic built in. Low power consumption due to energy efficient motor and other components. More compact design compared to other equivalent systems to save floor space. Higher up time due to proven design and reliable manufacturing. Ease of interface of the bundled software with existing systems, ERP, Warehouse Management Systems. Smooth operation: The system ensures jerk-free movement even at start – stop operations due to VFD (Variable Frequency Drive), avoiding damage to the stored material. Special technology for smooth engagement/ disengagement of moving parts ensures noise level well below 70 db. Safe and secure: The curtain sensors at the material retrieval window stop the system in case the material is protruding outside the tray or if an operator tries to access the shelf while it is running. Locking provision for the entire system and emergency stop switch provide further safety. Low power consumption: The system operates on single phase or three phase supply of 230 Volts and draws 10 Amp current. Specially developed energy efficient power management of Tech-Mark systems ensures further power saving. Power backup (optional): Single phase UPS provision for operating the system in case of power failure. Can also be operated manually. Quick installation: Our large manufacturing capacity allows shorter delivery periods. No special provisions are required on site such as pits/foundation and hence, this modular system can also be installed quickly on site. Quick retrieval of material: The automated system increases number of pickups per shift, effectively reducing manpower engagement. Typically, this system is nearly 80% more efficient than conventional storage. Optimum space utilisation: Effective use of optimum height results in floor space saving upto 80%. Manpower saving: Less manpower engagement compared to conventional stores. 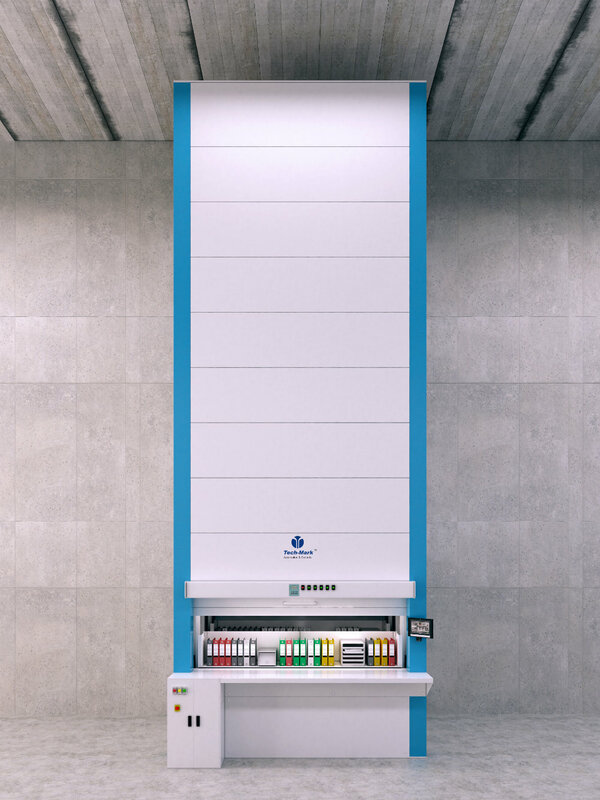 User-friendly: Even an unskilled person with a little training can very effectively use the Vertical Carousel – VStore Storage Systems. In case of power failure, it can be operated manually. Routine maintenance requires only oiling and greasing, which can be carried out easily by quickly removing the side covers. Operations @ a Click: The bundled software ensures all parts, documents can be retrieved at the click of a mouse from anywhere. Easy interfacing functionality of our software with existing systems makes the systems really integrated. The tables below are a representative matrix of Vertical Carousel – VStore based on standard sizes and load baring capacities. All our products are built to meet your specific requirements in terms of available space, weight of products and type of products. Why Companies prefer Tech Mark Storage Systems as compared to other Automated Storage Manufacturers such as Kardex Remstar or Hanel or Modula? 1. Custom Made Automated Storage Solutions V/s Standard Readymade Type. Kardex Remstar Shuttle , Hanel Lean Lift, Modula lift and other automated storage products manufactured by overseas manufacturers have their own standard dimensions and size for Storage Systems according to their Model. They do not provide customized solutions as per your site dimensions. Their parameters like Width, Height and Depth are fixed and standard. We at Tech Mark Storage Systems provide you with customized automated storage solutions to fit your available site dimensions. In case of above example, the available height of 4 meters can be fully utilized, thus avoiding wastage of space. In short considering the availability of Site Space / Dimensions, System can be designed and customized accordingly for optimum utilization of Space and every square, every inch can be utilized more effectively. Hence customized storage systems are always more economical than standard and readymade systems which are available in the market. Again overseas manufacturers like Kardex, Hannel, and Modula use Micro Controlled based Systems which can be maintained / altered / modified by Original Equipment Manufacturer (O.E.M.) only, where as Tech Mark Storage Systems uses open source technology like Siemens, Allen Bradley PLC etc. These PLC’s can be handled by any Programmer and the user can make certain customizations on his own, if required. More over communication with these PLC’s with customer’s E.R.P.or S.A.P. Platforms can be done in order to achieve seamless integration of Inventory with the Storage System. Also trouble shooting of certain issues can be done by the user or PLC Programmer. Considering the above facts, the Customized systems are most popular and sought after among companies in our Country. Tech Mark Storage Systems is an Indian Co. and we strongly support the ” MAKE IN INDIA ” Initiative. What is a Vertical Carousel Storage System? This is the most modern and cost-efficient Storage and Retrieval system for today’s industry. Vertical Carousel Systems offer a number of benefits compared to conventional racking system. The most significant advantage being, it uses the complete available height for storage which otherwise goes to waste and yet retrieves material automatically to the operator’s hand-reach level. 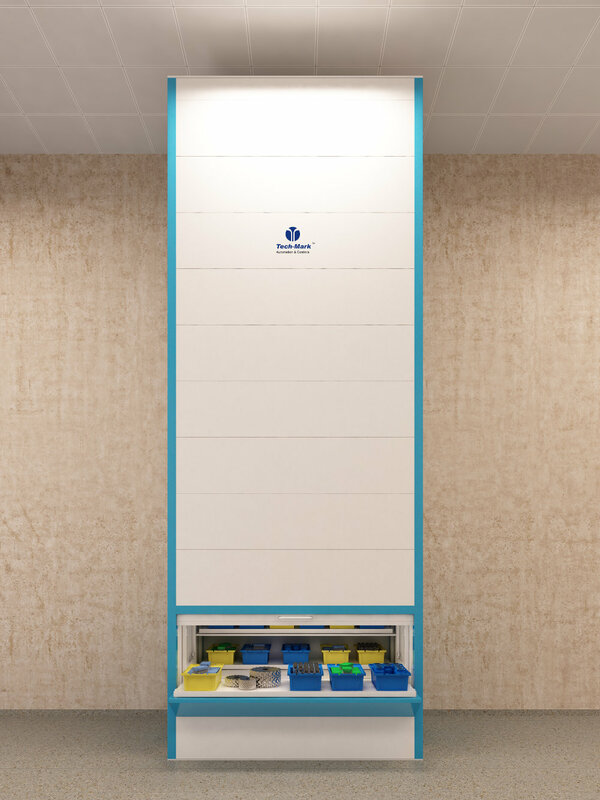 Vertical Carousel Storage System works on a simple Paternoster principle. The storage racks are suspended into two vertical chain loops which are electrically driven. The complete mechanisms enclosed by sheet metal cladding. Only one window is provided at ergonomic level for easy loading and unloading of material. Further the entire mechanism is provided by PLC controller, which facilitates material retrieval by a particular shelf number or part number. In case of Power failure these systems can be operated manually. These systems can be made as per available floor space and vertical space in different heights as per need. Documents as well as material can be retrieved fast due to higher speed and as the system rotates in clockwise or anticlockwise direction to select the shortest possible path. Vertical Storage Systems can be interfaced with central inventory management system or ERP through special software developed by Tech- Mark. What are the different Operating Modes of Vertical Carousel System?